1. Sift the flour into a mixing bowl, then add the salt, cocoa, coffee powder, icing sugar and cinnamon. 2. Next, add the lard. 3. Break the egg into the bowl and mix everything together really well using your hands. 4. Adding just a small amount at a time, pour in the Marsala & white wine vinegar, and mix it through. Do this gradually to make sure the dough remains soft and firm, and you might reach the consistency you need without adding all of these liquids. 5. Add a small amount of flour to your work bench an continue to knead the dough on top..
6. All of your ingredients should have come together at this point and it will feel a bit harder than bread dough. 7. Wrap it in cling film (glad wrap) and leave it in the fridge for 1 hour. 1. 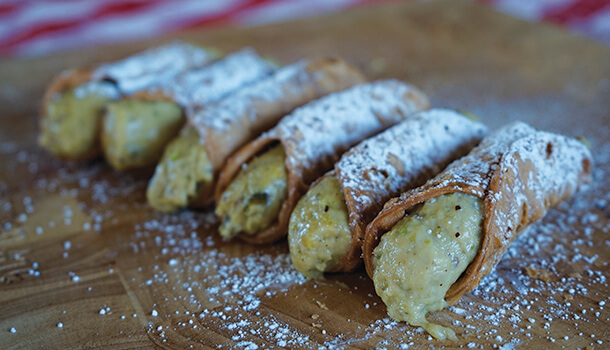 Mix egg yolks with 90g sugar using an electric hand mixer for the Italian Canolli with pistachio cream. 2. Add 50g flour and 100ml of milk and stir using a low speed until the flour dissolves. 3. Warm up 400ml of milk on a low heat. 4. Crush the pistachio nuts using a blender then use a mortar and pestle to mix with 2-3 tablespoons of evoo. 5. Once the milk is warm (not boiling), add the pistachio and use the electric mixer on a low speed to combine. 6. Add the egg mixture and continue to combine while the saucepan is still on heat until it becomes beautiful and creamy. Vincenzo's Tip: Add a small amount of additional flour if the cream is too runny. 7. Transfer the cream into a bowl and seal the bowl with glad wrap making sure it completely covers the top of the cream so no air can get in. 8. 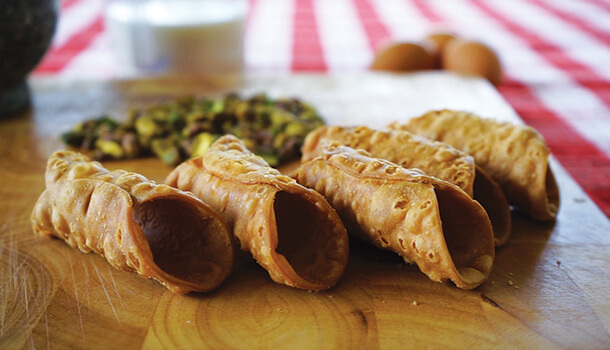 Put the cream in the fridge for at least an hour and fry up the canolli shells! 1. Remove the dough from the fridge and cut a piece from the end. 2. 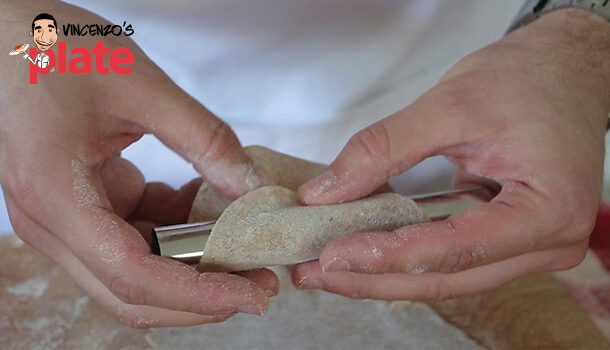 Add some flour to the work bench, place the dough in the centre, and begin to spread it out into a circle using a rolling pin. It should be no more than 1-2mm thick. 3. Using a round cookie cutter, cut out a circle, then lift it out and wrap it around one of the metal tubes until the ends meet and join the two together using a small amount of egg white. 4. Repeat this, covering all of the metal tubes. 5. Once the oil has reached 170-180°C, drop in two shells at a time, and allowing them to cook for around 2 minutes. Keep an eye on them, they should be brown but not burnt! Vincenzo's Tip: If you try to fry more than two at a time, the oil will start to cool down and you won't get a good result! 6. Only once the shells have completely cooled (this will take around 20 minutes), remove the metal tube and now they are ready to be filled! The shells should only be filled just before you serve or they won't stay crispy! 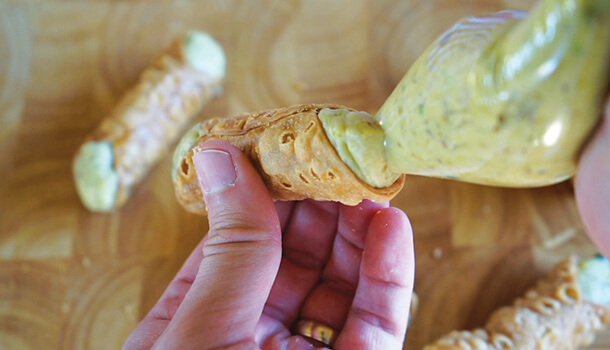 When it is time for dessert, fill a pastry bag with the pistachio cream, squeezing it into the tubes, getting enough on both sides. Vincenzo's Tip: If you don't have a pastry bag, just fill a small zip lock bag with the cream, and cut off one of the corners.